Hi, I have a 1981 Hobie 18 which just weighed in at 465. I’ve been racing it and doing a lot of work to the boat. The hulls are, for the most part tight with only a cup of water after a day of sailing,so it’s not a wet issue. There is floatation foam in the back of the hulls that seems pretty heavy and seems to be holding some moisture. Has anyone ever removed that foam and if so how? What would be the consequence of removing it? Does anyone have any ideas as to how I could lighten this boat up? I was thinking sanding the hulls down with 80g and working back up to 600 and polishing? 1) Older boats are heavier. Yours falls into the heavy but good structure range. A little newer (84-85) and it would be lighter and have a weaker structure, newer still and it would be lighter and good structure. 2) On my boat ('72) the foam is in plastic bags to keep it dry. Not sure if the later years had bagged foam. If your foam is not bagged it may be water logged. 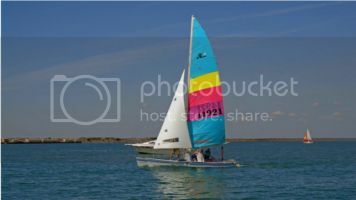 Sunfish sailors have been known to dry the foam out by running a fan through the hulls stored in a dry space all winter. 3) You won't save a lot of weight by removing the gelcoat, and you will be left with a boat without much gelcoat to protect it. In short, your boat is heavy and there isn't much you can do about it. You can look for a newer, lighter set of hulls, or just get some fancy new sails to speed things up. Spend your time sailing. Skill goes much further than weight reduction in a race. Speed633 more or less got it. The only thing I would add is that some folks have removed water logged foam and replaced it with bundled up pool noodles or something similar. There are also floatation air bags that you can get to put in the hulls. I would definitely put something in there in case the boat gets holed it won't sink. To remove the old foam, add a 5" inspection port at the back of the deck and cut up / break the block into small pieces that can be pulled out. Vacuum up the mess. Once you have the second inspection port added, remove both port covers and put a small fan in one of the openings. Let the fan sit as long as possible (days, weeks, months....) to dry out the hulls. Then sail the boat as much as possible and never put it on a scale again. The other question to be asked is, how are you weighing the boat and is your method capable of providing an accurate measurement? The only thing I would add is that some folks have removed water logged foam and replaced it with bundled up pool noodles or something similar. There are also floatation air bags that you can get to put in the hulls. I would definitely put something in there in case the boat gets holed it won't sink. If you remove the foam, the boat is no longer class legal, even if you replace the flotation with pool noodles (per a ruling by the IHCA Rules Committee a few years ago). Also, the plastic bag around the foam was not to keep it dry, but to prevent the polystyrene resin fumes from attacking the styrofoam when the boat was built. The bag has a tendency to disintegrate over time and come out through the drain plug in little pieces. I agree with speed633, sanding is a bad idea. 80 grit will go through the gel coat in a matter of seconds with a power sander. The gel coat on your hull is a couple hundred mils thick at most (<1/32") and probably makes up less than 10 lbs of the total boat weight anyways. And once it's removed, the hull will definitely absorb water (polyester resin tends to absorb water over time) and end up weighing even more. Besides that, to return the finish you'd need to sand with 120 grit, 180, 220, 240, 300, 400, 600, 800, 1000, 1200, 1400, 1600, and then polish. I've refinished my hulls and I could see the swirl marks from the 800 and 1000 grit sandpaper... had to go back with 1200, 1400 and 1600 grit to remove them. Last time I weighed my 1978 hulls, they were ~120 lbs each. Other folks with redline boats have posted hull weights around 95 lbs, so figure that you could have ~50 lbs more hull weight just in the extra resin from the original construction. As I mentioned, polyester resin absorbs water, so your hulls could be dry inside but still have moisture absorbed into the resin. The only solution for that would be to add an extra hull port and force ventilation through the hulls for a few days or weeks to dry them out. As others mentioned, polystyrene foam is known to be able to absorb quite a bit of weight in water - ventilation would help dry that out too. Like Matt said, removing the foam is not class legal, so you may not be able to race if you do. I completely agree with you srm, but I'm also not in charge of any racing events. It's possible (though I'd hope unlikely) that someone could take issue with it. The rule is there I'm sure to discourage people from making unsafe modifications to their boats, or at least discourage those who would from competing. I believe foam floatation is also required by the USCG and/or individual state laws for boats under 21 feet, but if it's waterlogged it's obviously not serving its purpose anyways. In my mind, removing it and replacing it is actually the more prudent thing to do, rather than sail a boat that has insufficient/waterlogged foam floatation. I've enjoyed the few races I've participated in, but I'm also not about to spend the $$$ to convert my mast or buy OEM sails to remain compliant with a dying class. I figure I'll be lucky to attend even as many as a half dozen Hobie sanctioned racing events before the class is completely gone, so the cost per return, so to speak, is too steep to even consider. The fleets in my area have long since abandoned Hobie's more restrictive class rules in favor of a more relaxed and inclusive atmosphere. Many boats in these fleets have aftermarket sails or older aluminum masts. They're also older, heavier boats that probably wouldn't be "competitive" vs a newer boat anyway. I'm not into racing for the points, I'm into it for the fun of it, so if someone takes issue with my original mast or aftermarket sails, I'll gladly take the DSQ if I'm still allowed to sail the course with the other boats. And if you want a set of the newest H18 hulls on the planet (model year 2011), boat last weighed in at 397, my boat is for sale. Get that old water logged foam out of there. There isnt an official Hobie sponsored 18 race anywhere on the planet that people are going to start looking in each others boats for the foam in an effort to try and win. They will just be happy there is a single boat to race against in the first place. If that wasnt the case the conversation should also dive into the fact you'd have to have all the warning stickers on your mast, the black max downhaul band, and hobie branded tramp (yet to see one in person myself ever) to still be "class legal". Heck, last H18 race we did almost half the fleet had solid masts including myself. I've made a lot of mod's on my boat and always check whats class allowable but dang if someone came up and tried to get someone dq'd from the class for not having original foam in the hulls they should be smacked in the face. Come on guys this aint the olympics. Neither of by boats have that crap in there so I just went to the dollar store and stocked up on a bunch of pool noodles which if ever protested I will pull out of the hulls and use to beat the said protestor repeatedly in the head about a million times until they gain some self respect. TAMUmpower, you've never seen a Hobie tramp? That's a shame, the Hobie tramps are definitely high quality! Mine is decades old, and (aside from some fading) still looks like new! I can't imagine any aftermarket tramp lasting nearly as long. If Hobie still made them in color, I'd definitely look to replace mine with an OEM tramp when mine does eventually give out. Unfortunately, I'm not too fond of a white trampoline on a white boat, and that's the only "color" of vinyl trampoline still made by Hobie for the 18's, so I'm not sure what I'll do. All I know is that I'll be taking the best possible care of my tramp until I have to make that call! Not knocking hobie but they arent a vinyl or thread manufacturing company so any materials that are presumed to be special high quality are not exclusive to the Hobie brand anyway. I don't know labor wise if they actually make the tramps but the sails back in the day were made by multiple lofts so saying hobie sails were high quality didnt even make sense as you were basically complimenting other peoples work as well. Realistically a tramp is a very simple item to manufacture. I actually made my own currently and would throw it up against any other tramp from a durability stand point. I'm not a fan of the vinyl tramps, but prefer trampoline mesh. You can buy enough for 2-3 tramps for like 50 bucks. The tramps that don't last from what I've seen are usually made without reinforcement webbing around grommets, the edges arent rolled, or in a lot of cases the thread is lower quality and UV just breaks it down. That being said sewing on new thread wouldn't take long, and given how long tramp material is UV stable for I could probably use the same tramp I made for the rest of the life of the boat if I wanted to by just re-sewing thread when/if needed. Fair enough. I suppose my point is I'm happy with my Hobie vinyl tramp, and I've heard that many aftermarket tramp makers make them cheap and they don't last as long. I don't have direct experience with that, aside from some very cheaply made mesh wing tramps I have. I like the vinyl in that it deflects a lot of the spray and seems to be a little "drier," though you of course get water pooling on the tramp too. I could see where making your own tramp could be much cheaper, I just don't have the skill for it! Hobie may contract out their sails and tramps, but however they do it they do it well. I have a couple of hobie cats from the 70's, and aside from the hiking straps rotting off the tramps are all in good shape. One of the boats has had the tramp on it for the last 12+? years, which involves a lot of UV and snow loads. Both of those boats still have their original sails, albeit in one case a little soft and faded. So yeah, the hobie vinyl tramps are tough as nails. They might be a bit heavier, more expensive, and trap water, but they last.